WARM WATER Warm water and a classic Nevada view — nothing more required. Burning Man side trip, anyone? Ditch the clothes and you’ll be right at home soaking in the buff at Trego Hot Springs. Located on the east side of the playa in the southern Black Rock Desert, this deep warm-water pond provides an all-natural mud bath thanks to the sediment that makes up the bottom of the spring. Just be careful getting in — there are a few other springs in the area that are at scalding temperatures, so it’s always wise to dip a toe first before making the full plunge. Find it: From Gerlach, head south on NV 447, then turn left on 48. This turns into Jungo Road. After 14 miles, hang a left on Trego Road and the springs will be approximately half a mile up on the right. 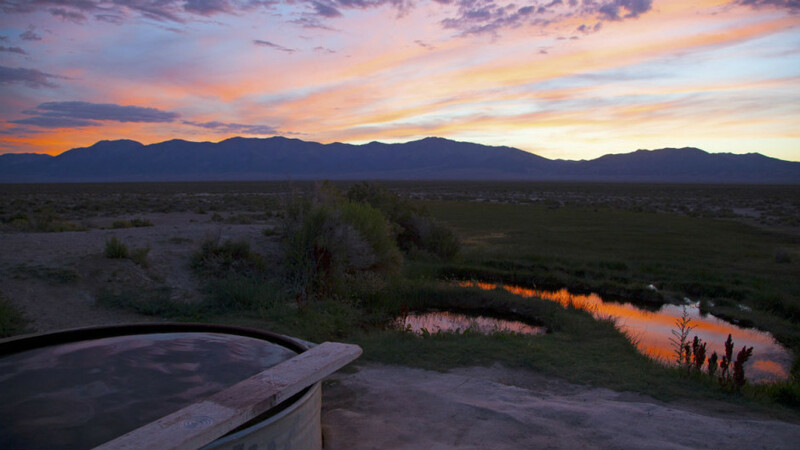 12 Mile Hot Springs is one of the most scenic places to take an au naturel dip in northern Nevada. Located outside Wells at the foot of the Humboldt Range, this massive, gravel-bottom soaking pool sits right on the creek with views of the rocky cliffs that flank the river’s edge. The pool is the ideal temperature, hovering right around 100 degrees — if you get too hot, you can always take a quick (and chilly!) dip in the river. Find it: From the town of Wells, make a left on 8th Street and drive 9.1 miles. Look for a dirt road on the right just past a series of old ranch houses. Head down this road for 2 miles until you reach the springs. Note: The road can get pretty hairy, and a high-clearance vehicle is recommended. If your car can’t make it to the end, go as far as you can and walk the rest of the way. In Nevada’s Great Basin, Fish Lake Valley Hot Springs is sandwiched between the Silver Peak Mountains and the White Mountains, while Boundary Peak — Nevada’s tallest — is directly west of the springs. The site comprises a large concrete hot pool and two natural warm ponds. Free camping, fire pits, and grills can attract a weekend crowd, so be prepared to don that birthday suit with other hot spring junkies. Find it: From the junction of NV 264 and 773, head south on 264 for almost 6 miles. Look for a gravel road on the east side of the highway. Follow this for 7 miles until you reach the parking area. Use this map to find all 8 Nevada hot springs on this list. Note: Some locations are approximations. The three tiered pools at Arizona Hot Spring are some of the most accessible from the Vegas strip. Just 45 minutes from downtown, they’re located in a narrow slot canyon above the Colorado River, where vertical canyon walls are as close as six feet apart, giving the springs a cave-like feel. The pools are built up with sandbags, and temperatures range from lukewarm in the lowest pool up to a blazing 111 degrees in the source pool. Wanna get naked? Go for a late-night trek and soak when you’re least likely to run into families. Find it: This spring sits on the Arizona side of the Colorado River, but is most easily accessed via the Las Vegas / Boulder City area. Park at the trailhead parking lot located 4.2 miles south of the Hoover Dam on US 93. From there, hike 3 miles down the wash until you come to the Colorado. Follow the river a quarter mile downstream, going over a hill that drops you at the beach. Walk up the canyon and climb the 20ft ladder to reach the first pool. Gold Strike Hot Springs are a second set of cascading pools on the Colorado River, where water trickles straight out of fractures in the canyon walls. Like Arizona Hot Spring, they’re located within Lake Mead National Recreation Area and can be reached via a four-mile hike down a narrow, rocky canyon. The trail itself is awesome, requiring scrambling and lowering yourself over several large boulders using ropes that have been installed at major obstacles. It’s nothing that a moderately limber adult can’t handle, but you’ll want to keep those clothes on until you reach your final destination. For a more unique adventure, you can also paddle to Gold Strike Hot Springs from Hoover Dam through the Black Canyon section of the Colorado River. There are a ton of Boulder City-based outfitters who rent kayaks or canoes and provide round-trip transportation. Find it: Just past the Hacienda Hotel & Casino on US 93, take exit 2. Make a left at the stop sign and drive down Gold Strike Canyon Road until you reach the trailhead. Spencer Hot Springs are primitive pools with a few nice manmade additions. First, you have the option of skinny dipping in a large metal tub. Being closest to the heat source, soaking here can get pretty steamy. When you’re ready to take it down a notch, use the diverter to adjust the temperature…or make a dash to the in-ground spring. Some nice rock shelving has been added to this natural pool for comfortable seating. In either pool, you’ll enjoy views of the open desert landscape backed by the peaks of Central Nevada’s Toiyabe Range. Look out for the local brood of wild burros while you bathe. Find it: From Austin, Nevada, head east on 50 and then south on 376. Make an immediate left on NF 001. After 5.6 miles you’ll reach a fork. Go left for another 1.6 miles and you’ll find the metal tub. Continue on another 500 or so yards to reach the second pool. Once a popular resort a few miles north of the semi-abandoned ghost town of Goldfield, Alkali Hot Springs now consists of two small concrete soaking tubs that vary in temperature from 100 to 108 degrees. While the water can get a bit murky, the remoteness of these springs means you should have them all to yourself, making them perfect for late-night nudie stargazing. Camping here is also free. Find it: Head 4 miles north of Goldfield, Nevada, on US 95 and hang a left on Silver Peak Road. At mile 7, the springs will be on your left. In the middle of a vast marsh at the edge of Elko County’s Ruby Wildlife Refuge, you’ll find a dozen or so isolated potholes framed by Nevada’s high-alpine Ruby Mountains. The main soaking pool is 50 feet across and deep enough to swim in, and depending on the season, temperatures range from 90 to 103 degrees. The surrounding field can get muddy, but there’s a couple of wood platforms at the edge of the cerulean pool where you can strip down or work on your full-body tan post-soak. Find it: From Elko, drive south on NV 227 for 6.8 miles. Then turn south on NV 228 towards Jiggs. Drive 30 miles and continue on to Harrison Pass Road, which becomes Forest Road 113. Continue on Forest Road 113 for 5.8 miles and turn north (left) onto Ruby Valley Road. Take your first right onto Harrison Pass Drive. Follow this for 1.1 miles and continue onto Ruby Wash Road for 1.5 miles. Finally, make three slight rights, now on rough terrain, to reach the springs.